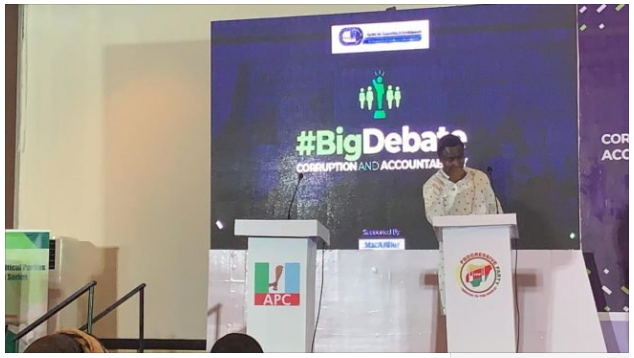 Buhari, the candidate of the All Progressives Congress (APC), is absent at the Big presidential debate. The debate, which is ongoing at Sheraton Hotel, Abuja, had representatives from all the other political parties invited, except the APC. The debate, which focuses on “Corruption and Accountability” is hosted by the Centre for Democracy and Development (CDD), and sponsored by MacArthur Foundation. Present at the debate are the presidential candidates of African Action Congress, and Abundant Nigeria Renewal Party, Omoyele Sowore and Tope Fasua. Kazeem Afegbua, a spokesperson of the Peoples Democratic Party (PDP) campaign and spokesperson to Ibrahim Babangida, former head of state, represented the party at the debate. Paul Isamadi, national secretary of the Allied Congress Party of Nigeria (ACPN), is currently representing Oby Ezekwesili, the ACPN presidential candidate. Buhari, the incumbent, and has not attended any presidential debate since the election season kicked off for the February 16 elections. Atiku Abubakar of the PDP has also been absent from all debates — but has delegated proxies to the debates. Other presidential candidates present at the event took jabs at the president for his failure to show up for the debate, and other debates.